I just discovered one of the bests websites I have seen about sustainable architecture...and it is sponsored by a government! www.greenhouse.gov.au/yourhome is a joint initiative of the Australian Government and Australian design and construction industries. They describe this site as "a suite of consumer and technical guide materials and tools developed to encourage the design, construction or renovation of homes to be comfortable, healthy and more environmentally sustainable." There are two main on-line packages available here: A Consumer Guide and a Technical Manual, which can either be read on-line or downloaded as PDF files. The Consumer Guide features an introduction to good design, guidelines for choosing a place to live, points to consider in either designing or purchasing a home, furnishing the home efficiently and how to help the environment while doing all of this. The Technical Manual goes further into the nitty gritty of good passive solar design, water use, material use, energy use, and site impacts. There is even a section with lots of case studies of various houses to study. Within the section about materials you can find chapters about embodied energy, rammed earth, adobe, and strawbale. I heartily recommend taking a look at this fine introduction to sustainable architecture. I wanna involve myself to save this earth from global warming and make the earth cool, so please guide me. I am from India. I am a cricket coach, but I love nature and wish to see this world full of green and bring true peace and friendship on each and everyone's heart and break the boundries on the nation and make this earth as one nation which should be ruled by love and everyone wanna get everything. Atually there is no heaven after death; true heaven is the earth. Tell me how are humans going to save the nature for the next generation? Just tell my why humans are not thinking about the danger happening against the nature. Look, the educated people are also not thinking to save the earth; they are all living selfish. Why? Who made them like that? Actually the present life style makes every one to compete with others to earn money. Some selfish business kings make the humans to only live in this way. Please I wanna do a lot for nature and humanity. Please help me and give a good suggestion. I believe that you answered your own question. The present life styles that are popular in much of the world do not encourage people to think about what is best for the earth and their fellow inhabitants of the earth. Instead we are encouraged to always consume more and more to make more profits for the few who are mighty and powerful. All we can do is speak out as you are doing, and live a life that is an example of sustainability. Thank you for speaking your mind and love of life! For the past twelve years Joe Kennedy has been intimately involved in creating sustainable settlements in South Africa, trying to create models of dwellings that could serve the poor. In 2003 he was approached by the NextAid organization to help them create a child support center in a rural town outside of Johannesburg called Dennilton. Dennilton is faced with extreme poverty (95% unemployment) and a 40% HIV infection rate. 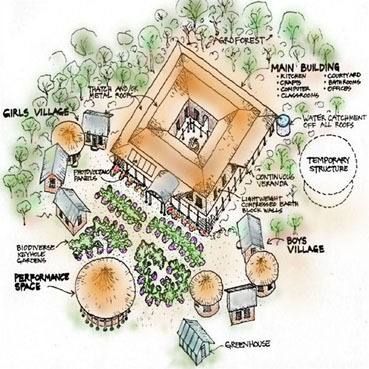 This center, for a group called Youth With a Vision, will eventually incorporate an orphan/elder ecovillage, performance and study spaces, a micro-enterprise element and sustainable food production systems. It is their hope that this center can be the first of many to serve the over 12 million orphans of the HIV/AIDS crisis in Africa. NextAid has purchased a 16-acre piece of land that will be the site of the center. During the 2½ week design/building and training intensive in July they will be developing the design of the center and initiating construction of a house and general purpose space to be used by Youth With a Vision. They will be using local materials such as earth to minimize cost and make the building systems available to the local community. They will be working with a local builder who will be continuing work with the community after the intensive training session is completed. Joe will also be working with local colleagues in Cape Town to develop housing strategies for the crowded townships and informal settlements there.